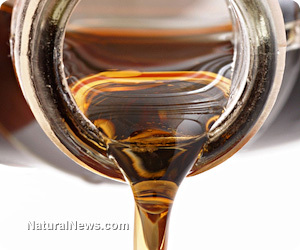 (NaturalNews) There is quite a lot of scientific evidence regarding pure maple syrup's health benefits. University of Rhode Island (URI) assistant pharmacy professor and researcher Navindra Seeram has revealed 34 new beneficial compounds, bringing the total to 54 in pure Quebec maple syrup. He presented research data at the 241st American Chemical Society's (ACS) National Meeting in Ahaheim, California, in March 2014. Pure maple syrup is not to be confused with the colored fructose and sugar water sold as pancake syrups in supermarkets and used by most restaurants. The real stuff starts as a sap from maple trees in the Quebec Province of Canada or in Upstate New York or the upper New England states. Sugar maples grow elsewhere but are usually used for lumber. The maple syrup industry's main sources are in those northern states. If the sap is collected early in the spring season, it usually requires over 20 gallons of water to be boiled out for 1 gallon of light-amber-colored syrup, labeled as Grade A. This grade has more to do with the timing than the quality, as many prefer Grade B maple syrup, which is tapped at the end of the spring harvesting season. Because sap toward the end of the season is more watery, it requires boiling out much more water to get a gallon than the 20-plus needed for Grade A syrup. More boiling increases viscosity, deepens color, adds flavor and may boost nutritional concentration. Some time ago, because of conditioned quality assumptions based on alphabet sequencing, Grade A syrup was preferred. But more have since changed to Grade B, which also seems to be getting harder to find lately. According to Seeram's report, 20 of the 34 newest healthy compounds were discovered during the year prior to this ACS conference, five of which had never before been seen in nature. High mineral content in maple syrup has been known for years. Manganese, magnesium, calcium and zinc make maple syrup's mineral content similar to that of molasses without its overpowering taste. Most of our food comes from soil that has been minerally depleted, producing foods with insufficient mineral content. Most of our bad health comes from mineral deficiencies. Without minerals, vitamins can't be effectively metabolized. Many obscure plolyphenols and antioxidant compounds that create positive internal health cascades are among the 54 healthy compounds found in maple syrup. Some are anticarcinogenic, and some are helpful for avoiding or minimizing diabetes risks and symptoms to the point where even "pre-diabetic" metabolic disorder folks can use pure maple syrup moderately. A Japanese study conducted by Dr. Keiko Abe of the University of Tokyo's Graduate School of Agricultural and Life Sciences determined that mice fed real maple syrup had much better liver function than mice fed fake sugar water syrups. Pure maple syrup is a sweetener that supports liver function. At the ACS conference, Seeram stated, "I continue to say that nature is the best chemist, and that maple syrup is becoming a champion food when it comes to the number and variety of beneficial compounds found in it." He added, "It's important to note that in our laboratory research we found that several of these compounds possess anti-oxidant and anti-inflammatory properties, which have been shown to fight cancer, diabetes and bacterial illnesses." By using pure maple syrup as a sweetener when appropriate, you are helping yourself overcome mineral deficiencies, fight cancer and diabetes and promote better health. How sweet is that?